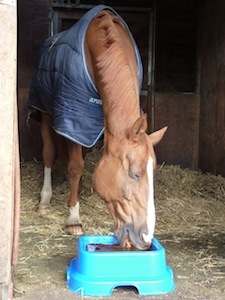 health and wellbeing in older horses and those that require a little additional nutritional support. Horslyx provides the solution as the high specification vitamin, mineral and trace element package incorporates Vitamin C, Vitamin E and selenium to support and maintain a strong, healthy immune system. The simple and easy to use nutritious lick, when supplied alongside good quality forage, is a cost effective, complete method of feeding veterans. In addition the palatable lick provides a natural trickle feeding pattern, allowing easily digestible nutrition and optimum absorption time. Horslyx supplies the balance of all the nutrients required for general wellbeing in just one tub and for owners wishing to support and maintain their horses flexibility, Mobility Horslyx is perfect for those older horses and ponies in need of a supplement to aid healthy joints.